Here I wanted to reflect on some of the insights Cain’s work has to offer collaboration and “net work” for change. Essentially, she reminds us of an important element of diversity that we should not overlook in our change efforts – different cognitive processing styles and ways of responding to social stimulation. First of all, what is introversion? It is not shyness or asocial behavior. People who are introverted can certainly be shy or socially awkward (can’t we all? ), but introversion is first and foremost a response to social stimulation. Relative to those who are more extroverted, those who are introverted prefer less stimulation and tend to work more slowly and deliberately. Introversion tends to favor intimacy, listening, and some time alone. According to Cain’s assessment of the research, one third to one half of us in this country are introverted, while many can display extroverted tendencies. Well-known introverts include the likes of Mahatma Gandhi, Eleanor Roosevelt, Albert Einstein, Rosa Parks, Pablo Picasso, and Steve Wozniak. In a fascinating historical review, Cain traces a mainstream cultural trend in our country that shifted preference from “the culture of character” to “a culture of personality,” where public performance and gregariousness became equated with success and strong leadership (think Dale Carnegie and his books How to Win Friends and Influence People and Public Speaking and Influencing Men in Business). To this day, in many workplaces, schools, and families, Cain suggests that there is a preference for extroverted ways of thinking and being. This flies in the face of data suggesting that introverted styles can equate with stronger academic performance and deeper knowledge in given fields. And yet . . . So what to do, especially in collective change efforts? Understand that brainstorming as it is usually done (in person and through whole group discussion from the get-go) privileges extroversion, and that furthermore research shows it leads less to innovation and more to group bonding (not a bad thing). Make space for people to work and think alone before bringing a group and their ideas together. Beautiful post, Curtis. I had to laugh at the picture though – which looks fairly anti-social! LOL! One thing I’ve been reading recently is that having time to write is more something to design in for extroverts – who need to get thinking out. Having quiet time is more helpful for introverts. Very thoughtful piece. Thank you! Thank, Linda. I couldn’t resist the photo, and I love the title – “How not to manage an introvert.” Obviously makes an extreme point about the feelings of isolation we can create or perpetuate! I am interested in the research that shows introverts actually take in more information and are more deeply stimulated by it, thus they need more time to make sense of it. In large groups, I sometimes design opportunities for those “scanners” who have been standing back and processing to step up and share their perceptions. They can often articulate the very thing the group has been deeply longing to understand or bring forth, because they have been taking in so much, and understanding how it all connects. This is extremely helpful, specially for a pretty extreme extrovert like myself. The cultural bias is very very deep. Facilitation and group process tend to bias towards extroverts. I am grateful for the years of conversation we’ve had at IISC, it literally has helped with my marriage to a powerful and profoundly wise introvert. I wonder if there is any correlation between being a lousy talker and having lousy ideas? Not sure if you are being serious, CJ, but I certainly know that there have been people with great ideas who just couldn’t articulate them clearly or compellingly. I am just finishing Quiet this week too, and have found it to be such a good lesson and reminder for how to design truly inclusive learning experiences. And, it’s been more than a little thought-provoking about my own introverted tendencies. 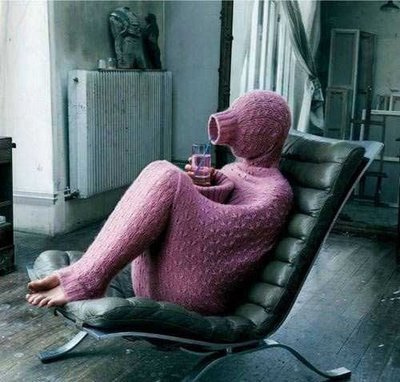 I must say, that body sweater looks SO appealing to me, but it may just be the negative New England temps! Thanks for the post, Curtis!